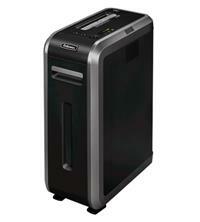 The Fellowes Powershred 125Ci is a heavy use office shredder with the ability to shred up to 18 sheets at a time. It has a P-4 security level rating which makes it ideal for highly confidential shredding - and it will shred an A4 sheet into small cross-cut particles measuring 3.9 x 38mm. The shredder is recommended for 3-5 users and has a large 53 litre pull-out style bin, making it easy to empty. In addition to shredding paper, it will also take staples, paperclips, credit cards and CDs - great if you have a requirement to shred these various different types of media. The Powershred 125Ci can be used continuously for up to 45 minutes, making it perfect for those offices that have a large shredding requirement. After 45 minutes of continuous shredding, it will need a 45 minute cool down period. The shredder also comes with a number of features including: SafeSense Technology which immediately stops the shredder if hands touch the paper entry; a 100% Jam Proof System which measures the thickness of the paper about to be shredded and alerts you if it is too much, thereby helping to eliminate paper jams; SilentShred to reduce noise in a shared work environment; a Sleep Mode energy savings system which powers down the shredder if it is left inactive for more than 2 minutes; overheat, door open and bin full indicators; and a reverse function. Fellowes recommend oiling your shredder every time you empty the waste bin, in order to keep it optimised for peak performance. One compatible oil is Fellowes product code 35250.